Diary of a Tinkerer – Part 2: Fire – Steampunk – Shrunk! A new day dawns, and if I can permit myself a brief moment of nostalgia for my – temporarily – lost world and stature, I shall temper that with enthusiasm for the construction of my engine room. This is progressing well. Yesterday my enterprising assistant was able to help me to construct the furnace for the steam generator. True, in her dimension it is a small box coated with some strange, shiny substance, but for my present scale (one twelfth of my accustomed size) it provides a sturdy and robust firebox, particularly as much of it is lined with copper. “We can use one of these to make the fire, Henry,” she announced, producing a cylindrical appliance of oriental construction, which utilises something she calls a ‘battery’ to produce a flickering flame in a small translucent bulb. “It’s a battery tea light,” she continued, as if all should then become clear to me. Nothing daunted, the redoubtable lady collected a sheet of extremely thin and pliable aluminium from her kitchen. It apparently has some culinary purpose which I am unable to comprehend. Having screwed it into a lump, she proceeded to spray it black. I have to admit, it certainly resembles a coal heap and the good lady assures me it will serve as such. I trust that she is not merely humouring me. “I’m not sure how you would be able to light it, though,” she remarked, dubiously. I am pleased to say that I provided a solution to that difficulty. However I am too fatigued by my day’s exertions to record the details now. It will have to wait for another occasion. 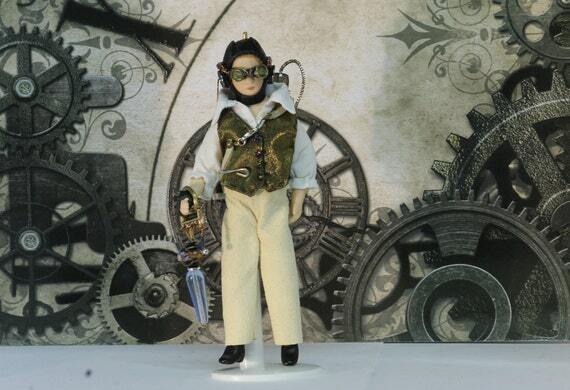 Should you wish to become better acquainted with Henry, do visit him at the Steampunk Dolls’ House. He’d enjoy the company. The link is here. Pingback: Book a Bargain – Steampunk – Shrunk!